Pigi traditional village house, just off village centre with whitewashed lanes, bouganvilla and mimosa growing over the walls. Pop round the corner and collect your fresh bread from coulas, baked in a wood smoked oven.or shop in the local bakers,and butchers selling home made sausages , wine, raki local honey and yoghurt. 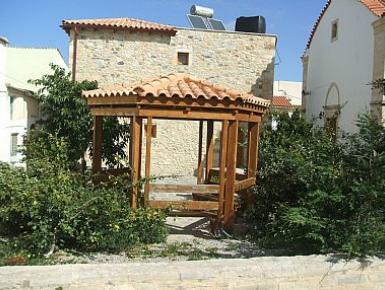 Try some traditional food and drink in Zorbas in the village square. eat under the jacaranda tree, try Marias traditional dish of the day. or souvlaki, pork chops and lamb from the charcoal grill.or if you prefer you can cook your own on the lovely stone bbq. at he house and sit out in the small private courtyard . The village is well provided for with a small supermarket, pharmacy, two butchers,and two bakers, providing fresh bread every day and local traditional products.